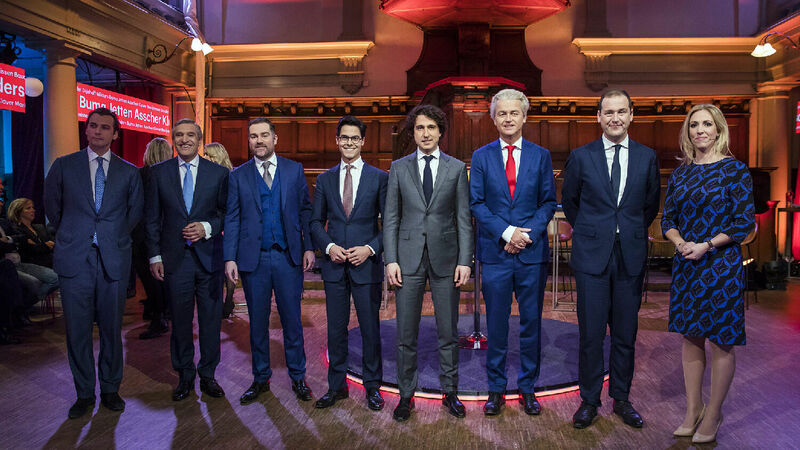 From left: Party leaders Thierry Baudet of the Forum for Democracy, Sybrand Buma of the Christian Democratic Appeal, Klaas Dijkhoff of the People’s Party for Freedom and Democracy, Rob Jetten of the D66, Jesse Klaver of the GroenLinks, Geert Wilders of the Party for Freedom, Lodewijk Asscher of the Labour Party and Lilian Marijnissen of the Socialist Party pose for a group photo prior to an election debate by RTL television channel in Amsterdam, the Netherlands, on March 7. Dutch populist Thierry Baudet and his Forum for Democracy party stunned the Netherlands on March 14. Forum for Democracy won the most votes in provincial elections to become the nation’s largest party, taking seats from Prime Minister Mark Rutte’s center-right party and the ruling coalition. Established in 2016, Forum for Democracy now has more seats in parliament than the People’s Party for Freedom and Democracy, which is led by Prime Minister Rutte. With this election, Baudet achieved what Foreign Policy called “one of the greatest political upsets in Dutch political history” (emphasis added throughout). The entire March 14 election was an upset for established parties and various euroskeptic and Green parties made notable gains, endangering Rutte’s hold on the upper house of the Dutch parliament. But the biggest surprise of the day was Thierry Baudet, a well-educated, right-wing politician who has risen from obscurity and is redefining what populism means in the Netherlands. On issues such as the European Union, migration and the economy, Baudet holds similar views to those of iconic Dutch populist Geert Wilders. However, it appears as if Wilders, whose party lost seats in parliament, is being replaced by Baudet and Forum for Democracy. What makes Baudet so appealing to Dutch voters? Baudet is both an intellectual and an extrovert. He has both brains and personality, and uses these strengths to connect with the average citizen. When speaking to supporters, Baudet doesn’t get lost in the weeds of a topic or focus mainly on one particular issue. He’s not like Wilders, who concentrates mainly on migration. Rather, Baudet is “very good at widening that into a broader populist and nativist narrative,” said Pepijn Bergsen, a manager at the business advisory company Flint Global. There are ways in which Baudet echoes Wilders. He has criticized the “party cartel” of elitist Dutch politicians and positioned himself as a popular outsider who will bring the long-desired change. He has even repeated some of the anti-EU refrains bandied by some euroskeptic populists. “I am ideologically against the EU, against the internal market, against the open borders, against the euro, against the whole thing,” Baudet says. However, there are important differences in how the Dutch perceive Baudet as opposed to Wilders. One elderly woman who voted for Baudet was robbed in her own driveway by a migrant; yet she said to France24, “I don’t have anything against Muslims, just about how they were integrated into our society. In fact, I am voting for Baudet because he is less aggressive against Muslim people than Wilders.” This is how the vast majority of Dutch feel about Muslims. They don’t hate them; they just want to feel safe and secure. Baudet has a similarly nuanced view of Muslims. While he recognizes the problems associated with migration and Islam in the Netherlands, he doesn’t advocate radical solutions. He addresses the problem and proposes solutions, and all in a manner many see as civilized and progressive. One can follow Baudet without feeling like a xenophobe. Baudet markets himself as a highly educated, culturally refined reformer who is fighting for the good of the people. He doesn’t want to be perceived as extreme or radical. His social media posts often depict his cultural pursuits, such as playing piano and chess. He avoids overtly anti-Islamic comments and confrontational rhetoric, preferring allusions to classical literature. He holds a doctorate in law, has studied political science, and enjoys reading philosophy. And he is not afraid to showcase his academic background. At his victory speech last month, he proclaimed that the “owl of Minerva has landed,” a reference to the story of the Roman god of wisdom. Baudet’s victory speech contained not only references to Roman mythology, but also allusions to religion and nationalism. Baudet’s “appeal to a shared past” was intended to “fill the void that globalization and secularization have left behind,” wrote Hans-Martien ten Napel, an associate professor of constitutional and administrative law at the University of Leiden. Thierry Baudet isn’t the first populist leader to have smashing success in national elections. In the last few years, we’ve seen Matteo Salvini in Italy, Viktor Orbán in Hungary, and Sebastian Kurz in Austria all shoot to the top. Though each of these men is unique, there are similarities between them. Most notably, all of them promote traditional Christian values and encourage their citizens to embrace Europe’s Christian heritage. The Bible predicted long ago the reemergence of an intensely nationalistic, world-ruling power in Europe—a power that would be united for a short time by its common religious roots. The Apostle John discussed this at length in Revelation 17. Herbert W. Armstrong, founder of the Plain Truth newsmagazine, spoke often of this vital and specific prophecy and its relevance to our lives today. “And there are seven kings: five are fallen, and one is, and the other is not yet come; and when he cometh, he must continue a short space” (Revelation 17:10). This prophecy tells us that we can expect another strong leader in Europe—and the final resurrection of the Holy Roman Empire. Verses 3-4 show that this revival, like the others before it, will be led by a “woman,” or a religion. To read more about Europe’s coming transformation and how it will affect you, request your free copies of He Was Right and The Holy Roman Empire in Prophecy.